Satchidananda Ashram-Yogaville® is a vibrant spiritual center founded by Sri Swami Satchidananda. A unique Yoga community, it serves as an oasis for spiritual unfoldment, benefiting residents and guests alike. Situated on the banks of the James River in Buckingham, Virginia with the Blue Ridge Mountains as a backdrop, it encompasses over 600 acres of serene, wooded landscape. 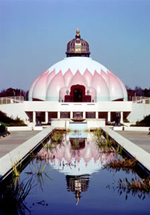 Five sacred sites, including Light Of Truth Universal Shrine, provide a variety of options for meditation, prayer and spiritual gatherings. Our members have come together from a wide range of backgrounds and nationalities to live the simple yet profound teachings of Integral Yoga®, based on maintaining our natural condition of an easeful body, peaceful mind and useful life. Our mission is to practice, live, and impart the Integral Yoga® teachings of Sri Swami Satchidananda to experience Supreme Peace and Joy, and to share that with one and all.